Commonly referred to as Petromat. Excess moisture in road bases is the primary cause of premature road failures. Ninety percent of sub grade and base moisture problems stem from rain and melting snow or ice entering the road through the surface. Heavy vehicle loads can cause extensive damage to roads, especially when the base is wet and weakened. 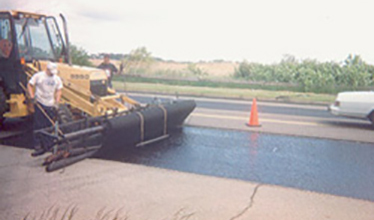 When installed between the old and new asphalt layers, a geotextile commonly called a paving fabric in this application helps retard reflective cracking and improve the overlay service life. The paving fabric absorbs the tack coat sprayed on the surface of the old pavement, creating a permanent moisture barrier. This paving fabric/asphalt interlayer system protects the sub grade from water intrusion and therefore sub grade strength loss. 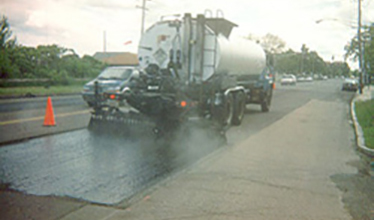 Pavement service life is extended, maintenance costs are reduced , and costly resurfacing is postponed years longer than is normal with conventional repaving techniques. This pavement overlay fabric and asphalt system may also retard reflective crack development in the overlay by providing a flexible stress relieving layer between the pavement and overlay. The predominant geotextile used in overlay applications is a lightweight non woven polypropylene or polyester fabric. Proper installation equipment and construction techniques are important factors in a quality installation. The asphalt tack coat must be applied at the correct application rate as specified by the manufacturer. Depending on the application where the geotextile will be used, we are able to offer a complete range of geotextiles that will fulfill the specific required functions. This incredibly strong membrane once installed stays bonded between the new and old layers of asphalt. It keeps cracks from migrating up to the surface of new pavement. Superior Sealcoat also installs reinforcing fabrics which are used for more localized repairs. These are commonly referred to as geo composites. The commonly referred to trade names are Geotac, Paveprep, or Petrotac. These are used for the same purpose as the full width fabrics but are commonly used to treat individual cracks. By partnering with Superior Sealcoat we can provide a full compliment of asphalt paving services to help enhance and prolong your pavement. 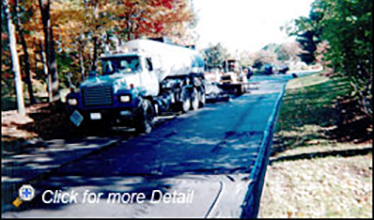 Call 978-988-5555 today to receive a asphalt paving estimate or click to request an estimate online.